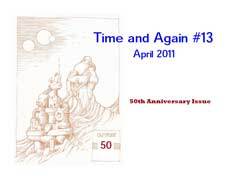 Time and Again is the new incarnation of David Burton's late fanzine Pixel, now taken over by Dave Locke. I'm sorry to note that Dave Locke died in October 2012. These issues of Time and Again will be maintained here in his memory.